The Atomium is one of the most unusual structures in Belgium. It was built in 1958 is over 300 feet tall and has nine large spheres which are connected by tubular passageways making the shape of a giant iron crystal cell. It’s open to the public and we’d really recommend a visit. Inside of the spheres you’ll find exhibition space, a restaurant and public areas with the top one having a lovely view of Brussels. To be honest, it doesn’t matter what’s inside really, as it’s the structure itself that’s the big highlight. The Atomium was looking a little run-down until 2006 when a large restoration took place. As part of the renovation, the faded aluminium spheres have now been swapped for dazzling stainless steel which makes it even more striking. As well as temporary exhibitions, there is also a permanent exhibition inside the Atomium which is about the 1950’s and in particular Expo 58 which the Atomium was created for. This exhibition covers 2 floors in the base sphere but there are further temporary exhibition in the other spheres. There are a number of places to eat including a restaurant in the upper sphere and a cafe in the central sphere. The Atomium is in Heysel Park next to Mini-Europe. The nearest metro station is Heysel/Heizel but we took the Brussels Hop-on, Hop-off Bus Tour to get here. 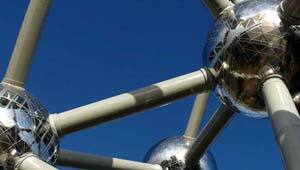 The Atomium is open daily from 10am to 6pm. Adult admission is 11 Euros although some discounts and concession are available (2010 prices).